Activision has taken the cover off the theme for the Zombies mode in Infinite Warfare, and it’s…interesting, to say the least. They told us the final zombie-related chapter in Black Ops 3 would be closing up the storyline to restart anew for…something. Are you prepared for the something? 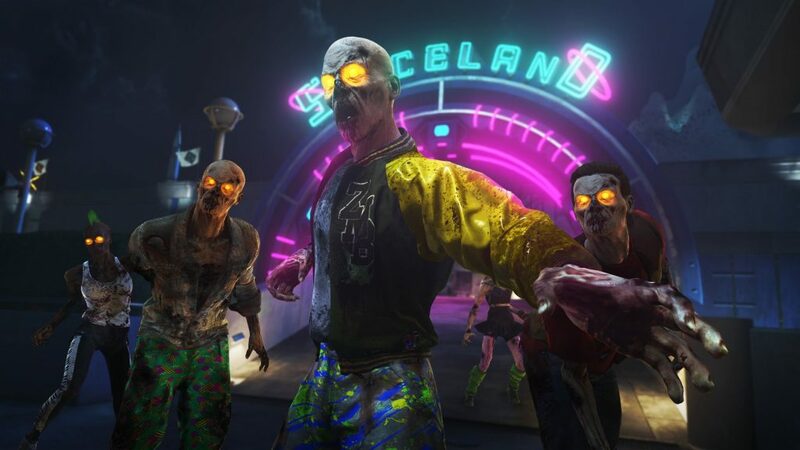 While the Zombies mode has never been completely serious, Zombies in Spaceland abandons any attempt at scares or genuine horror in favor of going day-glo nuts. Four aspiring actors are transported to a demented theme park run by a man named Willard Wyler (played by Paul “Pee Wee” Reubens). There they are clad in the outfits of four typical movie stereotypes from the 80’s: A.J. the Jock (Ike Barinholtz), Poindexter the Dork (Seth Green), Andre the Rapper (Jay Pharoh) and Sally the Valley Girl (Sasheer Zamata). From here they are mostly on their own, but they do have the help of David Hasslehoff, who I wish I could claim was playing himself (heck, why isn’t Pee Wee literally in this?) Instead he takes the role of a “mysterious DJ.” There’s a missed opportunity for a Thriller parody in this, but perhaps MJ was too expensive to license. At least no one can claim Call of Duty games don’t use colors anymore. Check out the video below, and “relax,” as Frankie say.